First up, my obsession with flamingoes has led me to these flamingo stickers which I think would be perfect to add a little splash of colour here and there in my diary. I also like decorating my planner and notebooks with washi tape, and this chevron washi tape would be perfect for decorating my pages in the summer months. I find myself highlighting a lot of things and I saw lots of tumblr folk using these Zebra mildliners , and I was intrigued… Pretty pastel highlighters?! Yes please. I know Angela of Paper Lovestory uses them too, finding them easier on the eyes than the bright, fluorescent highlighters we’re all used to. When I saw these turquoise paper clips, I thought they would look really nice in a little jar along with some other bits and pieces when I eventually turn my spare room into a workspace. I love the bright turquoise colour, so much nicer than plain silver ones! Finally, I really want to get some of the Oxford reporter’s notebooks for my work to-do lists. I’m currently using a pad that I got from the pound shop, but they are awful quality. These ones from Oxford have nice, bright quality paper… unlike the ones from the pound shop which almost rip every time I cross an item off my list! 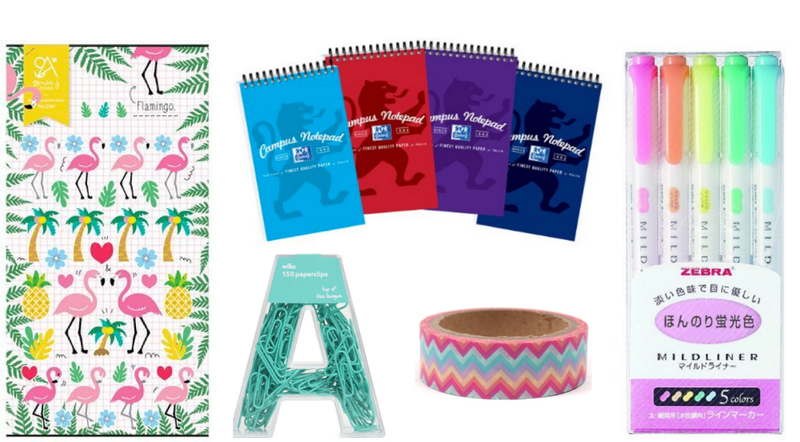 So… there we have it – a small wishlist of stationery items that I really want to purchase at some point. What items of stationery do you need in your life?